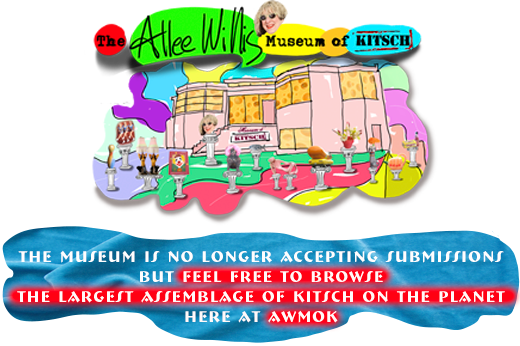 The Allee Willis Museum of Kitsch » CROCODILE ROCK…. Someone probably had enough time to make this while waiting in traffic…..smile.. I usually hate stuff that looks like this, tragic victim of 80s style art, but this is such creative use of traffic related paraphernalia I have to give it props. Really great. Where does this sit? Was it an installation? The brick will and dirt against it look Photoshoped in but as I can see your shadow (or whoever took the picture) I can’t hazard a firm guess. I was looking for a jungle alligator…and discovered alligators don’t come from the jungle but the crocodile does??? Had no idea about the different habitats for alligators and crocodiles. Well, this traffic cone alligator/crocodile – I’ve never actually known the difference between the two – has a permanent home here in the Jungle Animal Petting Zoo. I work for a traffic safety company and I’m working on a blog post about artwork made from traffic products. I’d love to feature this image. In exchange for your permission, I can give you a link back to your personal blog or elsewhere in return. I think that it’s quite important (and honest) to quote the artist BIBI http://www.bibi.fr/en . 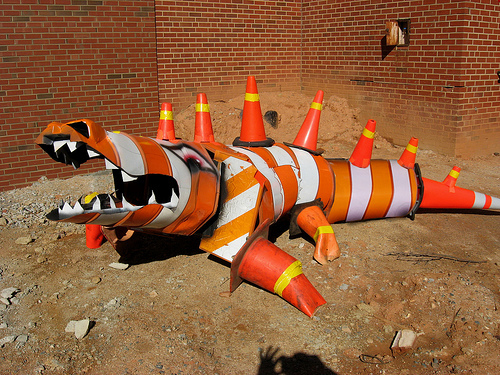 He performed a crocodile with traffic cones in 2003. He has created the urban hunting with traffic cones in 2001. Let’s talk about the first ones !